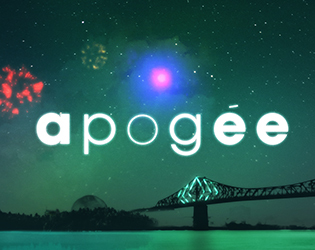 apogée is a collaborative game with the goal of making the most impressive fireworks display. The game progresses through harder patterns, but also advances mechanically through a greater number & different types of quick-time events. It is played with controllers. The left analog stick is used to maneuver your firework through the skies of Montreal in order to create the final masterpiece. The B button is used at the start of the round to determine what colour of firework each player is. It is also used to trigger the checkpoints while tracing their shapes.